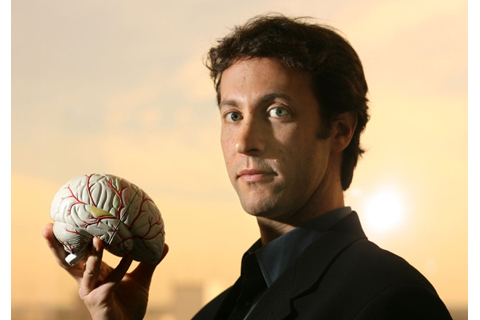 My first session was neuroscientist David Eagleman who is, according to his own website, “best known for his work on time perception, synesthesia, and neurolaw”. Somewhat outside the tech/digital programme I was expecting but since we’re doing lots about the brain at the moment, and since I needed a bit of a pick me up after spending over TWO HOURS queuing for my badge, I thought I’d give it a go as it sounded fascinating. He’s a hugely engaging speaker, witty and full of fantastic case studies to illustrate his point. Which was this: our conscious brain is just the tiny tip of a massive iceberg, and it’s what goes on behind the scenes that actually determines what we think and do. You may think that the decision you just made is borne of free will and rationality, but you were utterly unaware that your brain was whirring away below the surface, making that decision well before it apparently formed in your consciousness. A difficult idea to swallow, no? But he had some cracking examples to back this up. Nominative determinism is the theory that your name can affect your career choice and other aspects of your life that you’d hope were actually based on sensible, logical decision making. For instance, Eagleman pointed out that people called Dennis or Denise were disproportionately likely to become dentists. People also have a tendency to partner up with people who have a name that starts with the same first letter as theirs. Our consciousness, said Eagleman, is like a broom cupboard in a mansion, or a tiny part of a steamship which is taking credit for controlling the whole thing. But in fact, it’s just aware of headlines produced by the rest of the brain’s machinations such as “you like dentistry”, and is spared some of the troubling reasons as to why that might be. Perhaps we may have a sense of being conflicted about something as these subconscious processes battle it out. He discussed other examples of activities where we use the unconscious brain, such as playing the piano, or tennis, or trying to draw your name and its mirror image in the opposite direction at the same time. All of these are difficult or impossible once you try to think about them consciously. On which note, if someone is playing very well against you at tennis, compliment them and ask them how their excellent serve works – it will fall apart as they start to think about it. Even our perception of reality is constructed by processes that we aren’t aware of, as demonstrated by optical illusions and also by synaesthesia, a subject Eagleman has studied in depth. He suggested that we may all be a little synaesthetic, and he showed this with the audience using the Kiki/Bouba effect. One hundred percent of the audience identified the spiky shape as Kiki. The test for true synaesthesia is all about consistency in responses, and can be found at synesthete.org. Neuroscientists can use our responses to illusions as well as phenomena such as synaesthesia to study our vast subconscious depths. Another useful, if unfortunate, method is to see what happens when the brain is damaged in some way. The story of Phineas Gage who lost part of his frontal lobe and became a drastically different (and unpleasant) human being is well known, but he also cited the example of Charles Whitman, the “tower sniper” who killed 16 people at the University of Texas, just down the road from the Austin Convention centre where we were sat listening to Eagleman’s talk. He knew something was wrong with him and that his personality was changing to something angry and dangerous, and asked for an autopsy after his death. He was found to have a very aggressive brain tumour. Eagleman had another fascinating and disturbing example, that of a patient who had suddenly developed paedophilic urges and when examined, was founded to have a frontal lobe tumour. It was removed, and the urges went, only to reappear some time later. It was found that a small part of the tumour had been missed and was re-growing. In a case like this, these bizarre symptoms can be used for diagnosis. He gave the example of Parkinson’s disease, the treatment for which affects dopamine levels as it attempts to compensate for the diminished dopamine caused by the disease. Overcompensation can lead to decreased risk aversion, one effect of which can be to turn patients into gambling pleasure seekers. This behaviour can be used by doctors to see if they’ve given too high a dose, and they can therefore dial it back down until the behaviour stops to get the correct amount. So, what are the implications of all this for our society, our conceptions of right or wrong behaviour and how criminality should be punished? If we don’t really have free will, what affect should this have on our legal system? This is another area that Eagleman seems to have a particular interest in. If I understood him correctly, he suggested that explanations of bad or “immoral” behaviour are not necessary exculpations but should lead to better sentencing, better rehabilitation and incentivisation. He has set up the Initiative on Neuroscience and the Law to address these issues. A fairly mindblowing start to SXSW for me, and you can hear the whole talk here. I think much of this is from his book, Incognito, I will definitely be taking a look at it after hearing him speak, absolutely fascinating.